DWI Hit Parade! 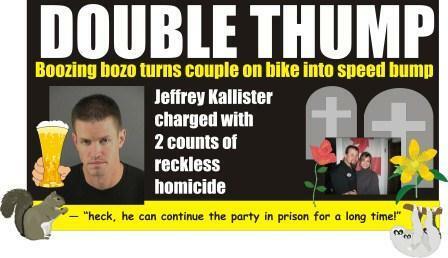 Over 3,543,036 Visitors | ILLINOIS: Jeff Kallister still doing hard time for DUI conviction in killing couple on motorcycle in 2011? 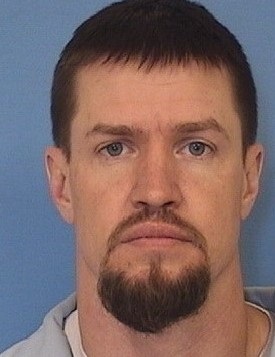 Jeffrey Kallister’s prison photo in Illinois. He is set to be paroled on April 15, 2019, for conviction of killing two people while he was driving drunk. Jeffrey Kallister is still in prison as of April 21, 2017, six years after killing Korey and Rachel Korenchuck. Kallister is scheduled to be released on parole on April 15, 2019. PEORIA —Korey and Rachel Korenchuk will be remembered by loved ones as a couple passionate about their two young daughters, Harley-Davidsons, and photography. Michael “Korey” Korenchuk, 40, and Rachel Korenchuk, 30, both of 1010 Nassau Drive, were killed early Sunday after their motorcycle was struck at a stop light by an alleged drunken driver. 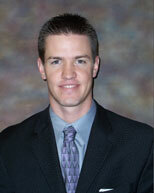 Jeff Kallister, the marketing manager at S & K Buick GMC, graduated from Bradley University majoring in TV & Radio Communications. Can S & K really afford to have its personnel driving around killing potential customers….impaired driving is a CHOICE, not an accident…hitting someone is a predictable outcome of driving after drinking. This entry was posted in DWI arrest photos, DWI Arrests by State, DWI crash photos, injury or death and tagged Driving Under the Influence, driving under the influence of alcohol, driving while impaired, drunk driving, DUI, DWI, Glen Avenue, Harley-Davidson, Hilary Korenchuk, Jeff Kallister, Jeffrey Kallister, Michael Korey Korenchuk, Rachel Korenchuk, S&K Buick. Bookmark the permalink.